On April 28, 2014 the California Department of Education released their latest data about the dropout and graduation rates for every school district in the State of California. VCUSD has typically been in the bottom 20% for standardized test scores. 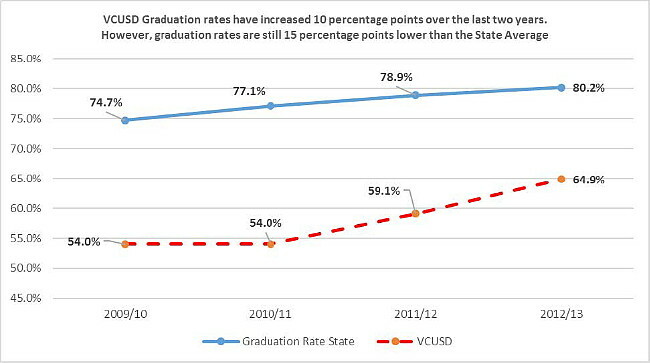 For 2012/13 VCUSD graduation rate improved by 5.1 percentage points to 65.9% and the dropout rate declined by 5.7 percentage points to 29.7%. The State graduation rate improved by 1.3% and the dropout rate declined by 1.5% State wide. 1) The dropout rate and graduation rate does not add up to 100% because some students receive special graduation certificates or after 4 years are still in high school. 2) Due to irregularities in the proctoring of the API (Academic Performance Index) standardized test, the latest API scores will not be posted for VCUSD by the state. The lack of standardized scores makes it impossible to determine if the new programs being introduced to the VCUSD are improving academic performance. 3) Despite claims such as, “The contributing factor to the district’s success includes becoming a Full Service Community School District” [VCUSD April 28 2014] many of these services are so new or only partially introduced and their effect on dropout/graduations rates is too early to tell. 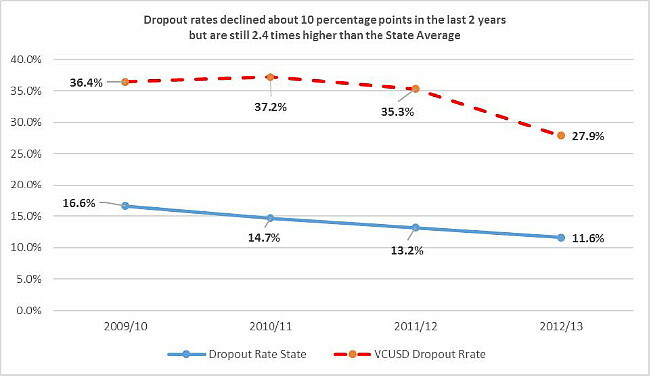 1) Dropout rates have declined 10 percentage points at VCUSD over the past 2 years but are still 2.4 times higher than the State Average. 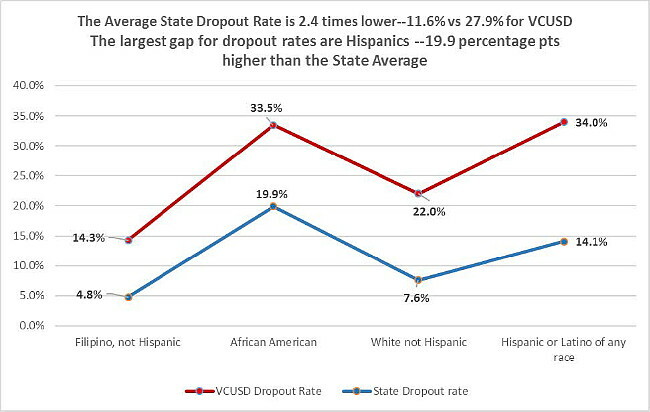 Prior to the new VCUSD Superintendent (Dr. Ramona Bishop) dropout rates had remained relatively flat. 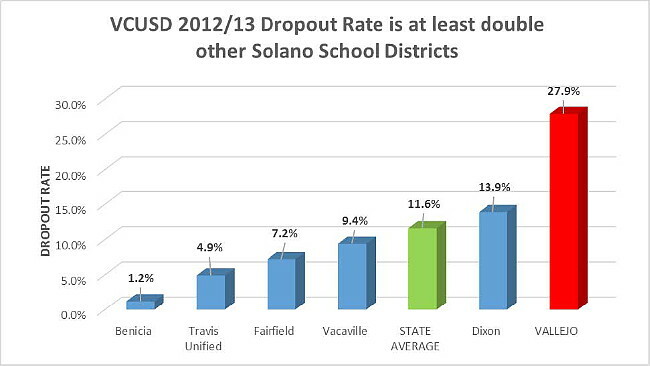 2) VCUSD dropout rate is at least 2 times higher than any other School District in Solano County. With the exception of the Dixon Unified School District, the other Solano County School Districts dropout rates are below the State Average. 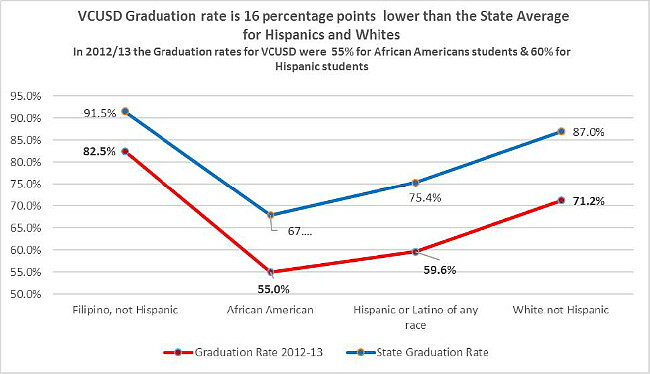 3) Even with a 10 percentage point increase in graduation rates over the past 2 years, VCUSD Graduation rate is still 15 points lower than the State Average. 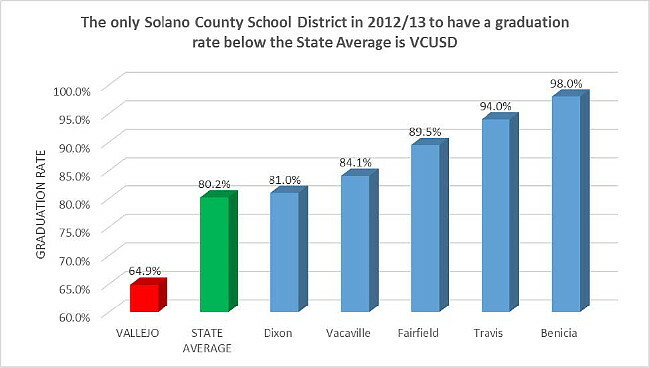 4) Most of the School Districts in Solano County have a graduation rate that is at least 20 percentage points higher than the VCUSD graduation rate. 1) The programs that the current Superintendent Dr. Ramona Bishop started when she first arrived (while the school was still under the State Administrators control) appear to be improving dropout and graduation rates. They have significantly lowered suspension and expulsion rates. Below is a list of these programs. Credit Recovery Program --The program also offers electives, which students can take once they finish their core classes. Positive Behavior Intervention--Establishes a positive and proactive school climate that guides how staff and students are to conduct themselves. Restorative Justice--Victims take an active role in the process, while offenders are encouraged to take responsibility for their actions, "to repair the harm they've done—by apologizing, returning stolen money, or community service. Wall to Wall Academies--Simultaneously prepare students for both college and the workforce. Students enroll in an academy as sophomores, joining a team of teachers who coordinate cross-curriculum lesson plans. Other programs being introduced are STEAM (Science, Technology, Engineering, Arts and Mathematics) Middle Schools, Themed K-8 schools and Full Service Community Schools (comprehensive academic, social, mental, and physical education services to meet student, family, and community needs). 2) The VCUSD Staff and School Board need to include comparisons to other districts and the State in presentations and discussions. Focusing on Vallejo can be misleading. Often State ratings have risen more than Vallejo’s. Rarely is there any discussion of how VCUSD ranks. At School Board meetings it feels that the Board tries to minimize “negativity”. Rarely is an in-depth presentation followed by much discussion. It is often the public who has to request follow-up reports (to determine what progress has been made). 3) While improvements are occurring, the VCUSD has a very long way to go before its academic performance is even considered average. Currently VCUSD ranks in the bottom 20% of the state. For too long the citizens of Vallejo have tolerated poor schools. The public needs to get more involved and keep demanding improvement. Just knowing that a score etc. has gone up is not sufficient. The question the public needs to ask is, whether the improvement is just keeping up with every other district or is VCUSD finally closing the gap. 4) As a first step the public needs to demand programs that effectively address substance abuse, safety in the classroom, truancy (it has been under reported), bullying, decaying infrastructure and improving the dropout rates and academic performance etc. The public then needs to demand follow-up reports to make sure the staff and School Board are doing what they promised. To date the public gets an F due to it's apathy. The School Board also gets an F for not adequately communicating problems with academic performance and safety. June of 2012, the Vallejo City Unified School District's Superintendent and Governing Board were charged by the community to significantly decrease the dropout rate. Today, the California Department of Education released state, county and city graduation and dropout rate outcomes, and the data shows that Vallejo is doing just that! The Vallejo City Unified School District's graduation rate improved from 60.8% in 2011-12 to 65.9% in the 2012-13 school year, a 5.1% increase, as compared to the state's improvement of 1.3% (CDE Data Reporting Office April 2014). Similarly, the dropout rate continues to be on the decline from 35.4% in 2011-12 to 29.7% in 2012-13 a decrease of 5.7%, as compared to the state's decline of 1.5% (CDE Data Reporting Office April 2014). The contributing factor to the district's success includes becoming a Full Service Community School District. This includes ensuring that all classrooms have a rigorous and relevant curriculum through the High School Wall-to-Wall Academies, STEAM Middle Schools and Themed K-8 schools. At each school, Positive Behavior Intervention Supports and Restorative Justice are the systems being used to create positive school cultures. The district has also focused on supporting high school students through the Credit Recovery Program. When asked about the improvement of the graduation rate, Dr. Bishop praised the hard work of all the teachers and district staff and stated, "Our work isn't done until we have 100% of our student’s graduate college and career ready!"